Any build is a journey of refinement as it progresses. Rather than beginning with an idea fully formed, I set off in a direction and look and listen for clues along the way. That’s not to say there isn’t a plan, just that it isn’t set in stone. The constraints of stubbornly adhering to a preconcieved path ignores the creative and intuitive process. As Hell’s Half Acre starts to shape up, with its rope purfling, my eye told me that a little extra touch was needed on the side of the instrument to balance out the busy look of the top. It didn’t need to be so ornate as to distract, so I settled on a single black stripe within the ivoroid binding. Starting with some strips of cellulose binding in ivoroid and black, it’s a matter of laminating three pieces togeter before adding it to the guitar. Acetone-solvent adhesive is used to melt and bond the edges together on a caul of aluminum. There is a raised stop that holds the parts true and provides sideways clamping pressure as the assembly sets up. There are lots of different ways to do this, but I used this technique to make some test strips up to check the appearance before I commit to it. The next step is to rough trim the black material so that it can be scraped flat to the ivoroid. The black strip was a little too big so I’ll have to trim it with a nipper. 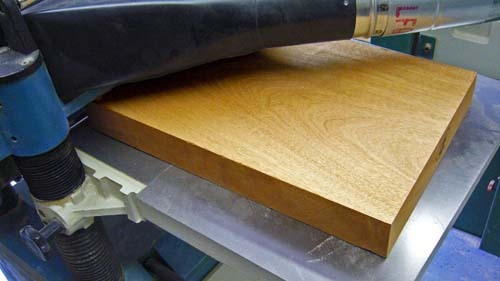 A few passes with the cabinet scraper is all that’s needed to get things ready to put on the body. I’l also trim the final edge on the binding to reduce the width of the small white stripe and make sure it fits perfectly into the routs on the instrument. I think this is going to look great on the sides of the guitar which will be painted with an opaque black lacquer. Pressing onward with the Hell’s Half Acre guitar, I’ve gotten the neck blank to the rough carve stage. To do this, I use a cabinet scraper as described in my previous post. After the truss rod has been installed and the spline glued in, the final headstock shape could be cut. Jim looks on as I finsih up. 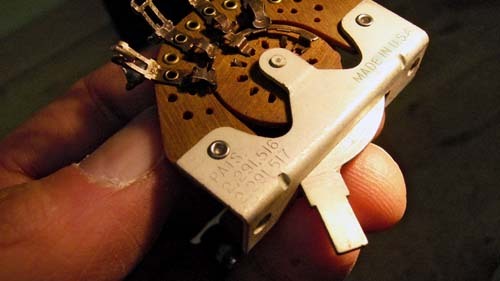 In the photo below, you can see the tuner holes which are undersized until the moment the tuners are fitted. This will give a snug fit for improved vibration transfer. Following in the footsteps of my last post, I’ve unearthed more vintage electronic parts from my stash. Both the Sakura and Hell’s Half Acre call for the use of three-way blade switches for pickup selection. This is one of several early 1950s vintage “blade” switches on my bench right now. Technically this type of device is referred to as a model 1454 rotary switch. In this case the rotation, or throw, is 30º. It was used for military and communications equipment because of its reliability—being rated for a minimum of twenty-five thousand cycles. In this photo you can see the two patent numbers stamped into the frame. Switches made after 1953 had three patent numbers. You can also appreciate the coarse grain of the brown phenolic which was a trademark look of the older materials. Its simple mechanical construction allows me to refurbish it to a perfect working order without losing its beautiful and rich patina of age. Salvaged from more telephone switching equipment, my piece was manufactured between 1950 and 1953 by Centralab in Milwaukee, Wisconsin. Much like the Western Electric plant, rows of operators toiled at punches, riveting the pieces of metal and phenolic together. In the 1980s around the same time that Western Electric was shutting down, the switch division of Centralab was sold off and shuttered. The buyer, Electroswitch was then acquired by ITT. The modern version of the trusty old 1454, known as E2G0203N is still made in Juarez, Mexico. 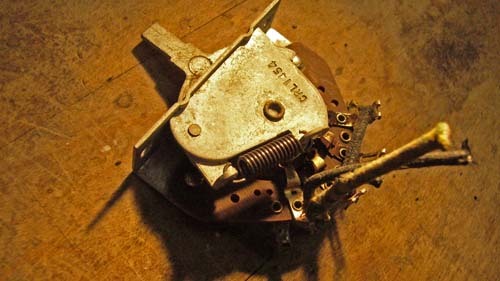 Does using vintage wire and switchgear make a guitar sound or play better? If this is what you’re asking, you’re missing the point. You can cover your wall with a twenty-dollar poster from Target if all you want is something to look at. If you are hoping for a deeper experience from the material things in your life, it has to come from a deeper place. 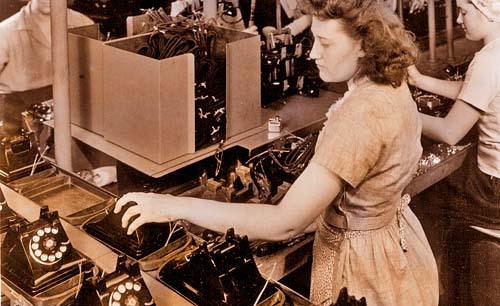 The Western Electric Company was America’s largest producer of electrical gear from 1870 until the 1980s. Known for their Bell Telephones and associated switchgear, they also manufactured amplifiers, speakers, microphones and wire. By 1917 their Hawthorne Works plant in Chicago was one of the largest manufacturing facilities in the world. Although the plant is now gone, what remains is a legacy of American manufacturing might, and a massive research project known as the Hawthorne Studies. The Hawthorne Studies were something I’d read about in high school. It was fascinating, and I struggled to use it as a guide when I became a factory department-manager at age nineteen. This research named for studies done at the behemoth Western Electric Hawthorne Works factory in Chicago was the world’s most comprehensive employee behavioral observation when conducted between 1924 and 1932. The Hawthorne Works sprawled over one hundred acres, employed over forty thousand Americans and generated a staggering $300,000,000.00 per year. This is equivalent to about $3.7 billion in today’s money. With vast amounts of capital to spend and even more to make through creating efficiencies, the Western Electric Company embarked upon an odyssey to use their employees as lab rats to determine how to make them work faster and better. The research covered all aspects of worker life too. The effects of smoking, alcohol and diet were put under the microscope in an exhaustive attempt to fine-tune Western Electric’s massive operation. In the workplace, researchers noticed a curious thing while conducting observations. If they increased lighting levels, productivity increased. When they lowered the lighting, productivity increased as well. By the time I read the studies in 1968 it was common knowledge that when workers know they are being studied, they tend to buckle down and try to look good for the bosses. My take-away from all of this was that people just want to be recognized for their contributions. It’s not about manipulating or threatening people, it’s about appreciation. When W.E. closed down, the assets were scattered to the winds. As part of the Federal Communications Commission’s break-up of AT&T, Western Electric was absorbed by a new entity, AT&T Technologies, in 1984. An American manufacturer was crushed. As luck would have it, I managed to collect a stash of Western Electric parts manufactured in the Hawthorne facility. I’ve always been a fan of tube amplification and mechanical switching mechanisms like the ones produced at Hawthorne, and a lot of this stuff was rescued from telephone switching stations when they went digital. 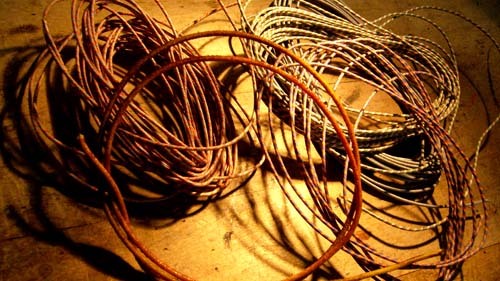 Here is some vintage cloth-covered Western Electric wire that I plan to use in The Crow, Sakura and Hell’s Half-Acre. It looks great, and is made to an insanely high quality compared to the imported junk available today. Think about the incalculable amount of energy and human conversation that has traveled through this wire. Routine or romantic calls, cries for help or joyous good news—this wire has heard it all. With its installation in a guitar, the work of the fine Western Electric employees can be appreciated again. Yesterday was a good day in The Workshop. The Sakura’s finish got sanded and sprayed with new coats of nitro. I selected a nice medium weight mahogany blank for Hell’s Half Acre and began mapping out the body. Because I make guitars one at a time, I can afford the luxury of finding and using really exquisite boards—many of which have been sitting for decades. This guitar will be a single cutaway solid body with a pair of humbucking pickups. The main section of the body will be a single slab of Honduras mahogany, with a figured maple top and back. The 8/4 billet above weighed in at fourteen pounds, but it’s going to lose well over half of that in machining. This is what the blank looks like after a few passes through the planer. A nice clean piece, ready to get a top and back. It’s almost a shame to cover up that beautiful grain, but we’ll know it’s in there, won’t we?